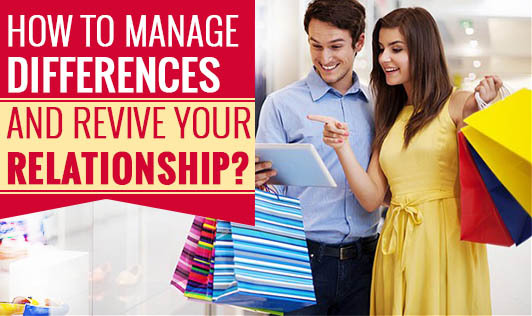 How to Manage Differences and Revive Your Relationship? Every relationship has its own set of joys and conflicts. Conflicts arise due to unmatched desires, separate needs, unfulfilled expectations, and many more reasons. The way these differences are managed and resolved, has a big impact on the strength and success of those relationships. Avoiding conflicts is NOT managing them. Disagreements don't sink relationships but they increase the understanding of each other’s needs and expectations. Avoid name-calling, labeling, or judging the other person. Instead, choose to understand the reason behind the conflict. Don’t assume. Assumptions give rise to conflicts that can be easily avoided by asking and investigating the reason behind the behavior in question. Don’t leave arguments unresolved. It leads to hurt and denial, and gives rise to defensiveness. These resentments are long term and affect the harmony of the relationship. Be flexible. Good relationships are negotiated and renegotiated all the time in an attempt to be best suited to each other’s needs and demands. Develop listening skills. Just listening with empathy and without judging can help to reach a quick solution without increasing the negativity of the conflict. Remember that above all, good will and unconditional efforts make relationships more harmonious.